Well we have to disagree here. So? There are many other KDE based desktop distros, why aren't they more popular than Ubuntu? Because the time was right for Ubuntu. Corel Linux did the same thing with KDE but the time was not right. Don't get me wrong, Ubuntu is a very polished distribution for users new to Linux, and they have put a lot of work into making GNOME usable (by default it isn't). I've programmed a lot using Qt and nothing could force me to program for GTK without a wrapper (like WxWidgets). Object orientation in C is a nightmare. And btw. if C++ is such a wonderful language then why does Qt need to extend it with signals/slots and their moc compiler? Because boost was not ready back when it was developed (it implements signals and slots now). And signals and slots are much more practical than callback pointers and similar perversions. 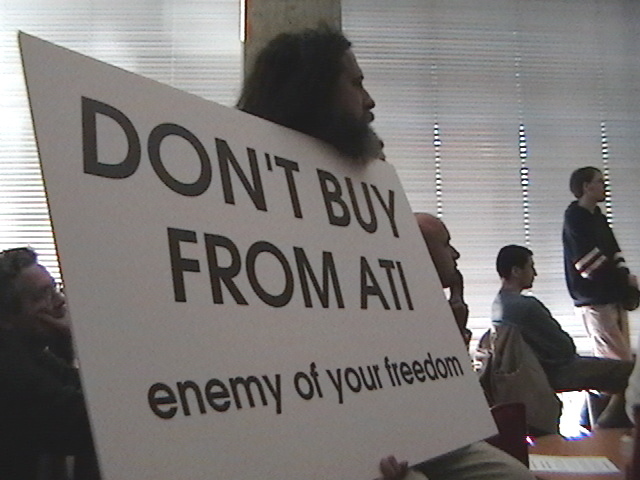 RMS buy AMD hardware and use KDE ;-) and he think : "nvidia/gnome fail"
It's a dangerous bet. And there is other hardware for which there is no accelerated 3d available. At the moment, I believe that only nv50-family hardware is approaching anything near usable 3d acceleration. is anybody else experiencing the bug, that makes opengl fullscreen application just draw straight into the buffer? even if you focus other applications you only see the opengl application. this bug was fixed for me in 10.6 and in 10.7 its back. Then call me insane. I was a die-hard KDE user in the 2.x days. Since 3.x, I find the further KDE changes their look and workflow, the less I like it. It literally disgusts me to look at the KDE interface these days. I have no idea how people can find it useable. GNOME is not perfect, but at least I only get bored with GNOME interface. Yep. Amongst other issues. I'm starting to build a bit of a laundry list of fglrx fail here unfortunately. Seriously, I still run original Pentiums. That and the Chips and Technology graphics chipset, GNOME 3 won't EVER RUN. At least Gnome 2.X will run. Hell, even KDE will run. I say this all, but I really use LXDE on it, it is just proof of concept. I might also just switch to LXDE or XFCE instead of KDE. It would be less of a jump, although, I did used to use Mandrake (now Mandriva) with KDE back in the day. I would like it if Ubuntu unbroke Kubuntu. Mostly, I would like Ubuntu to port all the specific Ubuntu tools to KDE. does this driver already work with maverick?